CHICAGO--(BUSINESS WIRE)-- Hyatt and Boutique Corporation Ltd. announce the opening of Hyatt Place Phuket, Patong on the island of Phuket, Thailand. The 161-room beachside hotel marks the first Hyatt Place hotel in Southeast Asia, and features the Hyatt Place brand’s stylish design, casual atmosphere and practical amenities such as free Wi-Fi and 24-hour food offerings. Hyatt Place Phuket, Patong is strategically located in the heart of Phuket overlooking the stunning white sand and sapphire blue sea of Patong Beach. The seafront is a short walk from the hotel and has spectacular panoramic views across the bay. Tucked away from the city center, the hotel provides guests with a sense of tranquility, yet also offers easy access to Patong’s entertainment options and activities like golf, diving and other water sports. Hyatt Place Phuket, Patong joins three Hyatt-branded hotels currently open in Thailand, including Grand Hyatt Erawan Bangkok, Hyatt Regency Hau Hin and Hyatt Regency Phuket Resort. Additionally, there are three hotels under development in Thailand, including Park Hyatt Bangkok, which is expected to open in late 2016, Hyatt Regency Bangkok, Sukhumvit and Hyatt Place Bangkok, Sukhumvit. 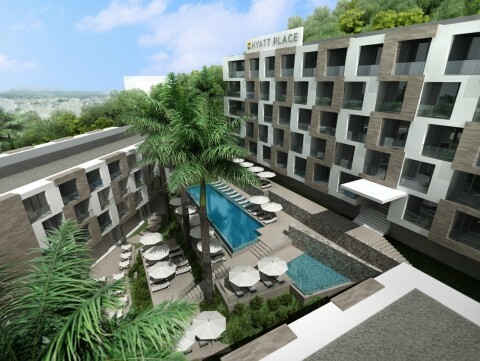 To learn more about Hyatt Place Phuket, Patong, or to make a reservation, visit www.phuketpatong.place.hyatt.com. Hyatt Place, a brand of Hyatt Hotels Corporation, combines style, innovation and 24/7 convenience to create a seamless stay with modern comforts. There are more than 245 Hyatt Place locations in the United States, Armenia, Chile, China, Costa Rica, Honduras, India, Mexico, Morocco, Nicaragua, Panama, Puerto Rico, The Netherlands, and United Arab Emirates. To learn more about Hyatt Place hotels or to make a reservation, visit www.hyattplace.com or call 1-888-HYATT-HP (888-492-8847). Boutique Corporation Ltd. is a leading property developer in Thailand, focusing on high quality serviced residences and hotels. The group currently owns multiple hospitality assets under the brands Citadines, Oakwood and Hyatt Place in major Thai cities such as Bangkok, Pattaya and Phuket. Additionally, Boutique Corporation has diversified into the retail development sector with Rain Hill on Sukhumvit 47, an award winning community mall.